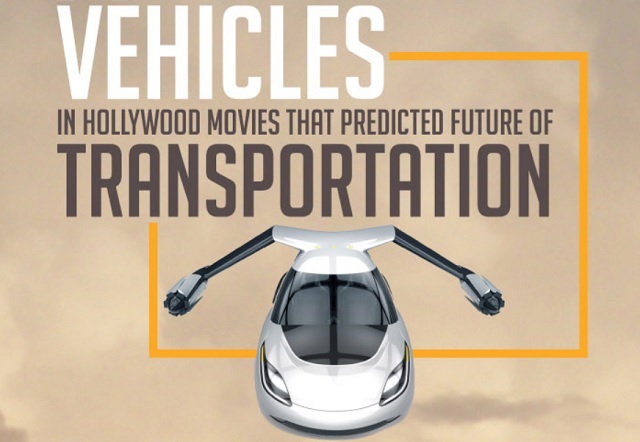 10 Vehicles In Movies That Predicted Future Of Transportation #infographic ~ Visualistan '+g+"
We owe big thanks to movies for giving us vivid dreams about the future. However, it’s true that often their perception and projection of future was over the top. But there were some brilliant concepts in movies which have fuelled many innovations, especially in transportation. For instance, Autonomous driving was indeed fantasy when it was first shown in the movie Total Recall (1990). Now Audi and Tesla have come up with cars which have got impeccable and amazing self-driving capabilities. Even though there is a long distance for us to see fully autonomous vehicles on roads, research is indicating that it might be nearby. The obvious question that might pop up while thinking about this subject would be about the movie that started it all. Undoubtedly the credit goes to 2001 A space odyssey directed by the legend Stanley Kubrick in the year 1968. The movie still baffles many as the majority of the tech innovations featured in the movie came to be true later. Coming back to transportation apart from the above-mentioned movie, there are a few ones which have managed to brilliantly predict our future means of transportation. Minority Report (2002), I Robot (2004), Total Recall etc. are some of the few. If you are wondering about rest of the name please have a look at this infographics and find out more about them.